It is no secret around here that I love my chickens. So when I was given a chance to review a book about chickens of course I was very excited! Yeah I know what you are thinking and giggling about my husband does it all the time.lol Impeccable Petunia was sent to me by the author Katie Christine and it wasn't only me that was super excited to read it. My daughter Allison shares so much joy in animals, so we sat down and read it together. 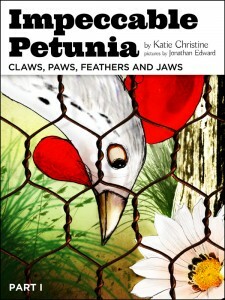 We laughed at the antics of the chickens and how well it was written from the view of the animals.Petunia is a chicken of a different color, not only in the way she looks but in the way she views the world. She befriends a human which of course is unheard of and as the flock reacts the story unfolds. The ending of the book only leaves you wanting more!This was a great book which my daughter and I really enjoyed reading it together we cannot wait until part two is released. I highly recommend this book for reading. It is available at Amazon to download to your kindle and make sure to visit her website to find out more about her upcoming books. I have been contemplating on whether or not to get my own chickens! My brother in law has 4 or 5 but he will has been contemplating switching to ducks...he also has maggots, yucks! Is it hard to take care of chickens? That sounds like such a cute book. I always love discovering new books to read with my daughter. Thanks for sharing. I wish we lived in a zone that permits chickens, I'd love to keep some for my family. This sounds like a great story, I love the name Petunia!